The bigger elections have always had a polling place in a neighbor’s garage, about a dozen houses away. Not this time. We were consolidated into a larger precinct, and several hundred voters converged on the nearest park to do their duty as a citizen. I didn’t even have to show an ID. I self-identified, signed in, and got a ballot. Every registered voter gets a sample ballot so they know what they’re up against. Candidates can buy space to put their statements into the ballot; I think it’s the best money any campaign can spend. Long explanations of every ballot initiative are in this 200+ page missive that was sent to our home. If you couldn’t get out of your car, they would bring a ballot to you. Drive up voting, if you will. No waiting at all at 4pm. California’s Redwood National Park. Photo by Aron Cooperman. Tweeted by the US Department of the Interior, 6/28/16. Sequoiadendron giganteum trees have been found to be 3,500 years old by counting their rings. Sequoia trees are the largest living things, growing to an average height of 164 – 279 feet and 20 – 26 feet in diameter. Record trees reach over 300′ in height. Mature trees are estimated to have 11,000 cones at any one time, and are thought to distribute 300,000+ seeds each year. In spite of that, the trees occur naturally only in groves on the western slopes of California’s Sierra Nevada Mountains. Giant sequoia trees in the Kings Canyon/Sequoia National Parks. Photo by Tiffany Nguyen. Tweeted by the US Department of the Interior, 10/19/15. Summer sunsets at Denali National Park and Preserve in Alaska are truly special. Kent Miller snapped this dream-like photo of a moose walking along Reflection Pond. In the background, the top of Denali is illuminated by the setting sun at midnight. Photo by Kent Miller, National Park Service. Tweeted by the US Department of the Interior, 7/23/15. A visit to Bering Land Bridge National Preserve can feel like traveling back in time. The Bering Land Bridge provided a pathway for plants, animals and people to cross from the old world to new. Wildlife like the muskox remind us of our ancestors and how geography has shaped humankind. These iconic herbivores sport curved horns and can weigh between 400-800 pounds. Although their populations have fluctuated over the last century, today they number around 3,800 in the state of Alaska. Posted on Tumblr by the US Department of the Interior, 8/31/15. A trail camera got this shot of a wolf pack in California … the first pack seen in the Golden State in nearly a century! Tweeted by the US Department of the Interior, 8/21/15. Bugling elk at Rocky Mountain National Park. Posted on Tumblr by the US Department of the Interior, 9/4/15. # 755, AKA Scare D Bear, generally does not visit Brooks Falls to fish when people are present. For the story of how bears interact – or avoid – humans, see http://www.nps.gov/katm/blogs/Late-Night-at-Brooks-Falls.htm. From the Katmai National Park website, published 8/31/15. While no one really knows the origin of the Whiskeytown name, local folklore tells of a miner by the name of Billie Peterson who had a mishap in the 1850’s. While hauling supplies back to his mine, the pack on his mule’s back came loose and a whiskey barrel went tumbling down the hillside, breaking on the rocks below and spilling its contents into the creek. From this christening came the name Whiskey Creek, and the small settlement that established itself next to the waterway became known as Whiskeytown. Known for the sapphire-blue waters of its lake, Whiskeytown National Recreation Area in Northern California has more to offer visitors. This 39,000-acre recreation area is also home to pristine mountains, 70 miles of hiking trails and stunning waterfalls — like Boulder Creek Falls pictured here. Photo by Jesse Barden. Posted on Tumblr by the US Department of the Interior, 10/14/14. I admit it: I’m a sucker for a star filter. But the photograph is spectacular, yes? 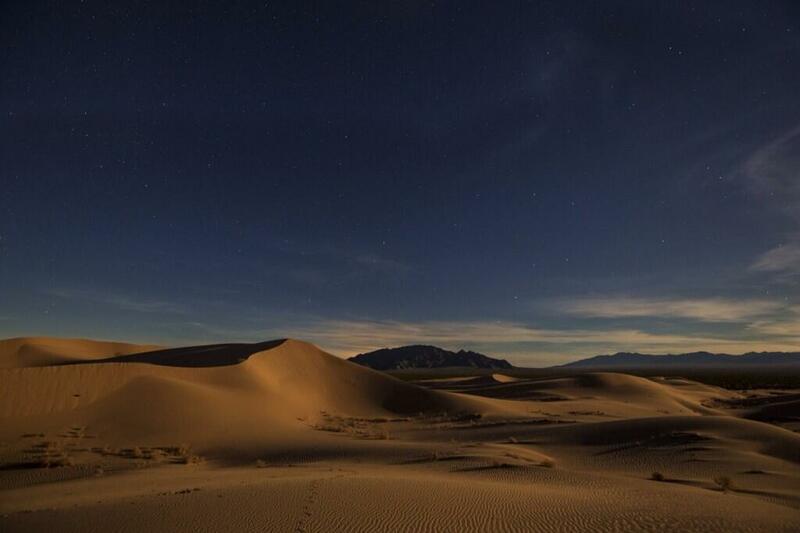 The United States Congress designated the Cadiz Dunes Wilderness in 1994 and it now has a total of 19,935 acres. All of this wilderness is located in California and is managed by the Bureau of Land Management. Tweeted by the US Department of the Interior, 2/18/14. 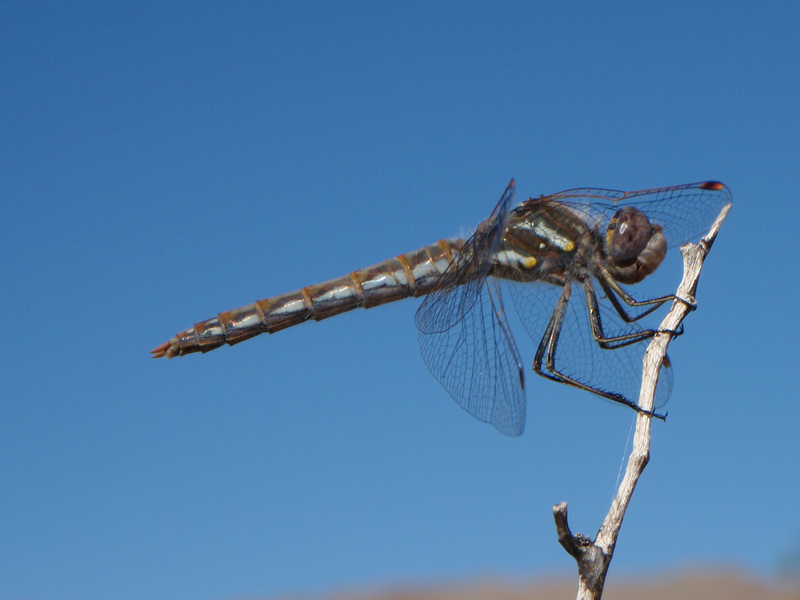 This dragonfly would not co-operate. It could not be approached from above or eye level, as it would fly off every time I got close. So I started by laying on my back and photographing it from about 3 feet below, SLOOOWLY raising my arm and pushing the shutter. Mostly, I was getting photos of blue sky, a piece of a blurry dragonfly, or just the branch. I couldn’t reach the tip of the branch that way. So I started to raise myself up on one arm, like a yoga-plank pose, one arm anchoring me, the other reaching up towards the sky, my body diagonal to the ground, my right hand only a few inches from the dragonfly. It took about 10-12 shots before I got this one. Underexposed by one stop to capture the blue sky! I’m loving this whole solar thing. Driving to Las Vegas a couple of weeks ago, I drove by Ivanpah, which is a tri-headed solar farm that will be coming online this summer. Click on the picture at right to get a better look at how one of the steam-driven solar collectors works. You really don’t get a sense of the scale of this project driving by … you just know it’s large. It’s a 3,500 acre installation … that’s almost 5-1/2 square miles! No wonder desert lovers are up in arms about this project … it’s truly destroying a very large swath of pristine desert, all in the hopes of creating some “green” energy. 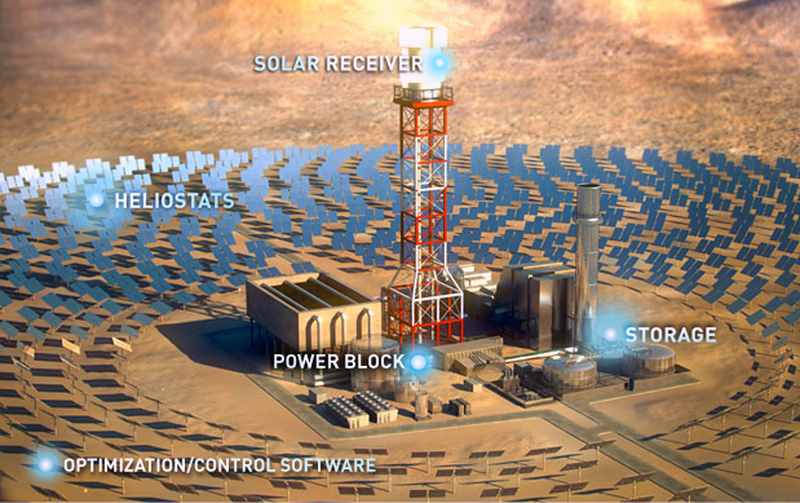 It’s been 5 years in the making, and will generate an additional 3,500 megawatts when it comes online. The project is costing $2.2 billion. And it’s not even working yet. 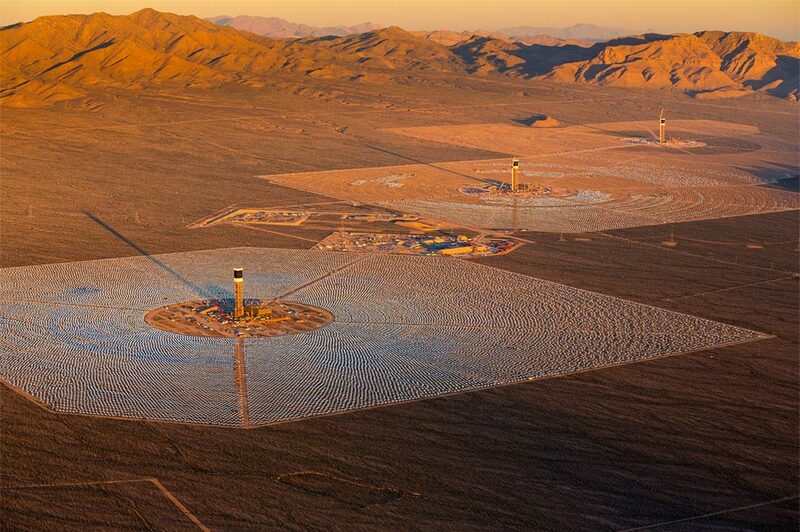 BrightSource’s Ivanpah solar plant, shown in these images, took more than five years to permit, finance, and build. The technology features thousands of mirrors that direct sunlight at a central tower to produce steam and power a turbine. Utilities in California are looking seriously at the technology because they must deliver a third of their power to consumers from renewables by 2020. In 2012, California became the first state to install more than 1,000 megawatts of solar collection capacity (that’s over 1 gigawatt). That’s going to be shattered in 2013 … and we’re not done. Another huge project is coming online in Riverside County, east of LA County, and that two-headed project is costing $2.6 billion and has a capacity of 500 megawatts. While the utilities are investing b-b-b-b-billions in solar, consumers are also getting on the bandwagon, and putting solar panels up on their roofs. That isn’t a very efficient way to lower their energy bills (see link below), but it is having a direct affect on how much they pay to the electrical utilities each month. Lancaster, California, became the first city in the country to require solar panels on all new housing construction. Given how solar is one of the least important things to lower power bills … good planning, Lancaster! Other states, including New York, Massachusetts, Louisiana and Virginia, have also been reviewing their programs, which are transforming the fundamental relationship between customers and their utilities. California schools have jumped on the band wagon … there’s a white paper, link below, on how school districts have embraced solar. Our local high school district, the William S. Hart Union High School District, has signed a 20-year agreement with a utility for “discounted” electrical rates, and in return they’ve “received” solar panel installations in a carport style over all of their parking lots. The good news for me as a tax payer, if you want to call it that, is that the School District signed this contract and since it’s zero cost, it’s “off book” – meaning there’s no direct budget impact. But there’s a 20-year commitment to buy electricity from the company that provided their solar panels for no charge. I loved finding out that they installed the collectors at Valencia High School facing the wrong way. 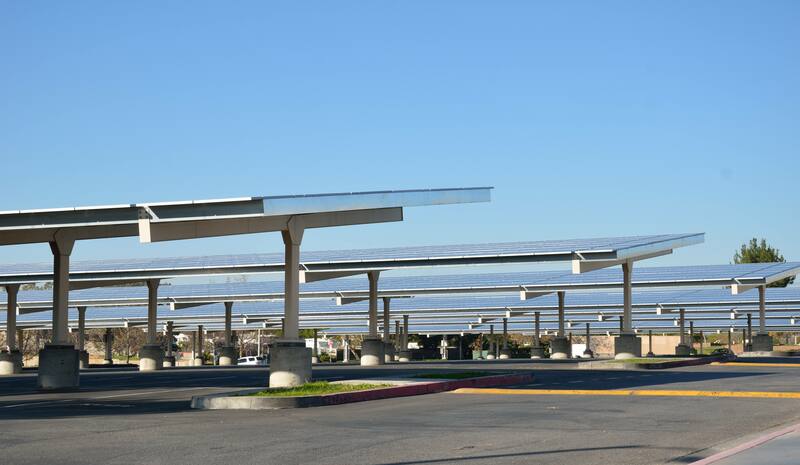 Valencia High School’s solar panels also provide shade to their parking lot. Where is it all going? No clue. But our state is committed to creating more solar energy. Here’s hoping it all works out for the best. How Green Do You Want Your Energy? My Grandfather was the one who mowed his yard with a horse. Shown here with 4 generations: my Grandfather, Great Grandmother, and my Great Great Grandmother Baugher holding my mother. Looks like a nice lawn. 1930. I am committed to taking responsibility for my lawn. As I confronted the truth of my G G G Aunt’s lack of lawn care, though, (pictures posted here and here), I began to question my assumptions … and remember my beginnings as a lawn care professional. Mom tells me that her family didn’t have a lawn mower when she was a kid. This would have been in the 30s … and she remembers her father cutting the blue grass perhaps 2 or 3 times a summer … with a horse-drawn mower. Dr John Falk theorizes that we want lawns because we evolved on the savannas of Africa. Our roots lead us to prefer grassy areas with scattered trees. So why don’t we want monkeys in the trees, I wonder? Lawns started with European nobility, actually. Louis XIV was the first to have a green lawn; his gardens at Versailles set a standard that the European aristocracy aspired to for centuries. Lawns were one way that the rich could differentiate themselves from the working class. If you could afford to keep a lawn, that meant you didn’t “have” to cultivate that land to feed your family. You had more land than you needed, so you could just plant grass that you couldn’t even eat! Conspicuous consumption in a pure form, as pointed out to me by Ed Darrell, who writes Millard Fillmore’s Bathtub. In the New World, it wasn’t until after the Revolutionary War that America’s leaders adopted lawns as well. Washington and Jefferson both had extensive lawns around their houses. Lawns didn’t make it to the common man until suburbs began to be built after the Civil War, according to Virginia Scott Jenkins, author of The Lawn: A History Of An American Obsession. Once you have a lawn, you have to cut it. In the beginning, that was done with goats, sheep … and serfs. And thus began man’s love affair with the Saturday afternoon ritual of cutting the grass. Here’s an illustration of the 1965 Craftsman riding mower that I used from elementary through high school. I even earned a dollar now and again. But … I Live In A Desert! Lawns aren’t normal in Southern California. Well, they are normal today, but they aren’t native. California’s native animal species regard lawns as no different from concrete! Native species prefer the shrubs and grasses native to the chaparral climate that my area has. That’s what they can live in. That’s what they can eat. Imported grass? Not their thing. My newfound love of native plant species would work very well for a xeriscaping effort in my yard. And wouldn’t I prefer spiny succulents and dried grasses that require almost no water and less care instead of the high maintenance blue fescue grass that will require an incredibly needy 2 hours a month to maintain? So, what should I do? I could keep the current lawn, meaning I have to buy a lawnmower and all of the wonderful tools necessary to keep a luxurious, soft, inviting green lawn. Or, I can tear out all of the grass that we had installed 7 years ago and replace it with a native xeriscape that is friendly to both the water supply and the native animals. The downside, unfortunately, is that I’ll need to avoid walking barefoot across the lawn, feeling the grass between my toes. I’m pretty sure the last time I did that, it was 2005.